Northern Basement Systems is more than just your local waterproofing contractor. We are part of a unique contractor network. The Basement Systems® International Network is a gathering of more than 300 basement waterproofing and crawl space repair contractor companies all across the United States and Canada. In business since 1987, the network is headquartered in a 92,000 square foot facility located in Seymour, Connecticut. The story of Basement Systems starts with company founder Larry Janesky. In 1983, Larry put an advertisement in the local newspaper saying: "Carpentry. No job too small. Call Larry." He started getting calls. Eventually, he started his own homebuilding and remodeling company. Soon after, Larry saw the need for basement waterproofing when one of the houses he built developed a cracked foundation wall that was leaking water into the basement. After some research, Larry decided that there had to be a better way to waterproof homes than the technology that was currently available. As a result, Connecticut Basement Systems, Inc. was born in 1987, with Basement Systems, Inc. and product development following in 1990. Over the years, we have won more than 40 awards for quality and innovation in our industry from the Connecticut Quality Improvement Award Partnership. Basement Systems®’ wet basement and crawl space systems have been installed in over 200,000 homes across the network, and they've proven the superior solution for waterproofing and moisture control. Each of our waterproofing products includes a written warranty, which is fully transferable to the next homeowner. Check out the Basement Systems timeline for a history of all of our award-winning products and company milestones. Our history with the Connecticut Better Business Bureau is meaningful to us and to the homeowners who put their trust in us. Our business practices have earned Basement Systems® an A+ rating with the BBB. Check out Basement System, Inc.’s Better Business Bureau profile. How does Northern Basement Systems benefit from being part of the network? As a member of the Basement Systems® International Network, Northern Basement Systems is able to provide our customers with industry-leading products and warranties, while remaining committed to personalized service and custom solutions. 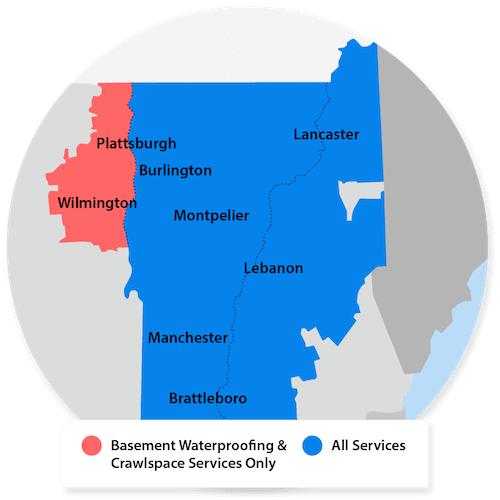 Learn more about our wet basement repair in Vermont and New Hampshire or contact us online to schedule an inspection and estimate today!